Now finished: Sarah Eyre & Ilona Kiss at Paper Gallery. 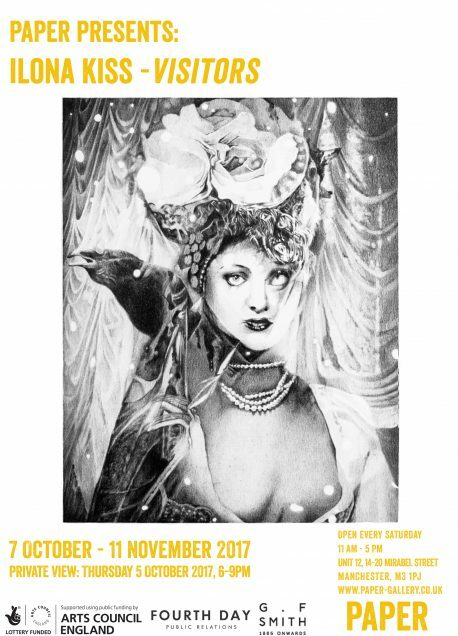 Paper Gallery’s October exhibitions explore the strange beauty of the surreal with two very different shows from artists Sarah Eyre and Ilona Kiss. Eyre’s Cut, Copy, Paste takes on the unlikely subject of wigs and playfully questions ideas of identity, gender and performance by asking how this inanimate object can be so full of character. Using photography and collage – cutting, layering and concealing parts of the image – she emphasises the strangeness of the wig when seen separated from the body, and reveals the malleable boundaries between body and object. In Visitors, Swiss artist Ilona Kiss depicts the surreal figures of her imagination with a distorted realism that makes her small graphite drawings at once familiar and weird. Displayed on shelves within the gallery, Kiss’s work offers a glimpse into the uncanny spaces of dream, fantasy and nightmare, where the visitors are ghostlike creatures, ambiguous rather than monstrous.